We offer private and customized Indian food tours and sightseeing (food walks), city walk tours in Delhi. It is a city tour, food walk, sightseeing, urban exploration and culinary tour of Delhi city in one package .The eating part of the food tour include sampling different varieties of street food from various places in the itinerary. Food is all that you can eat, but we insist you to have a little of everything and enjoy the variety. 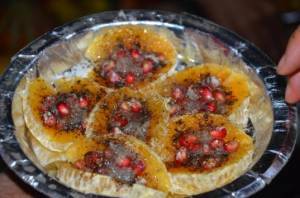 If you like some particular food item, we’ll get it packedold Delhi food walk it for you so that you may enjoy it later. We place a lot of stress on hygiene and only trusted and safe vendors which serve good and hygienic food are on our list. Apart from the usual and must see, the food tour will cover some under-rated and less explored places of Delhi which very few people know about. These places are not listed on most tourist guides. A lot of very good photo-opportunities and bragging rights are on line. During the food tours, you’ll get to taste some of the best Indian food dishes available in city from the oldest and most reputed food joints. The actual number is limited by your appetite. We’ll guide you about the dishes, the way to eat them and even their history if you’d like. For example, did you know that butter chicken was invented in a restaurant called Moti Mahal located in Daryaganj, central Delhi ? The food tour of Delhi will include not just the food attractions, but also some great landmarks and offbeat but worth visiting places of this city. 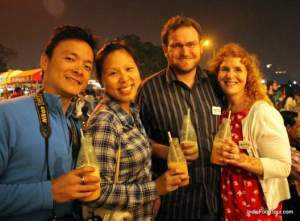 The city walk + food tour locations are set by different areas of Delhi. 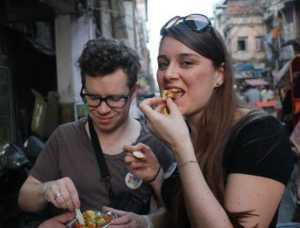 Our most popular street food tours by order are in Old Delhi, South Delhi, Central and East. Depending upon which places you want to see and food you want to enjoy, we can arrange food tour of one or more than one area. The timing of the tour is fixed according to preferences of the guests. A food walk through crowded markets of Old Delhi, this food walk will help you taste the best street food available in Delhi from some of the oldest food places in the city. During this food walk, we will visit 7-8 different food joints, each one of which is in business for decades, some being as old as 120 years. We will walk through some landmark markets, lively markets, ride rickshaws, walk a bit and stuff ourselves with delicious street food of Old Delhi. Cost: INR 4000 per guest for a group of 2 or more. INR 4500 for solo guest. Meet up point: Ticket counter near Gate number 2 of Chawari Bazaar Metro station. If coming by car, then gate number 3 of Jama Masjid. Cost: INR 5200 per guest on twin sharing. INR 5500 for solo guest. Meetup point: Ticket counter near Gate number 2 of Chawari Bazaar Metro station. If coming by car, then gate number 3 of Jama Masjid. A special food tour of Delhi with a local chef Rajeev, which gives you an insider’s view of the city’s food culture, food joints, kitchens and related businesses. The presence of a chef with an intimate knowledge of city and it’s cuisine makes it a special food tour unlike any other. Number of food dishes included: 18-20 dishes from 8-10 food joints including atleast one full meal. Cost: INR 6500 per guest for a group of 2 or more. INR 7500 for solo guest. Pickup and drop point: Free pickup and drop from central Delhi. Photographer: Hire a professional photographer to take your photos during the tour for just INR 5000. This charge is for whole group, not per guest cost. City walk of Old Delhi including Chandni Chowk, Hindu, Jain and Sikh temples, some heritage monuments and old bazaars. Tour of biggest spice market in India. Introduction to Indian food and Delhi. These city tours are meant for people who love photography and want to hone their skill with camera. We offer different variants of this tour to meet different needs of the guests. These photography tours combine the best of sightseeing and food along with a photo tour for the best experience for eyes, stomach and camera. Each tour is led by an expert who will help you to capture the most interesting sights of the city in your camera in best possible way in addition to helping you with sightseeing and food depending upon different type of tour. This short tour combines a photo tour of Old Delhi along with the food from some of it’s most interesting and oldest parts. 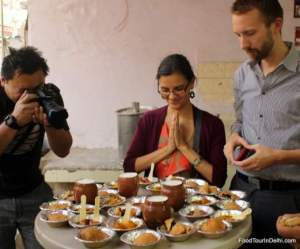 ACTIVITY: Food walk in Old Delhi, Photography tour. 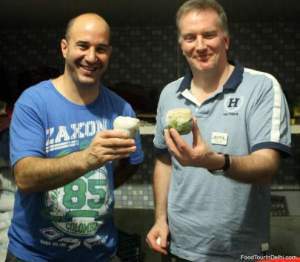 FOOD: 8-10 food dishes from best and oldest food joints of Old Delhi as part of food walk. PRICE: INR 6000 for one guest, INR 5500 for each extra guest. FOOD: 15-16 food dishes from best and oldest joints of Old Delhi as part of food walk. PRICE: INR 10000 for one guest, INR 8500 for each extra guest. This photo tour of Delhi covers some of it’s most popular monuments mentioned below. Instead of plain vanilla sightseeing, this tour includes a photo tour of the monuments led by an expert photographer. Depending upon time of starting the tour, it will include lunch or dinner depending upon starting time of tour. PLACES COVERED: Humayun’s Tomb, Lotus Temple, India Gate, Bangla Sahib Gurudwara,RajPath, Jantar Mantar, JanPath. FOOD: Lunch or dinner included. Snacks on the way. Choose this option if you want to have a photo shoot done while you are staying in New Delhi. 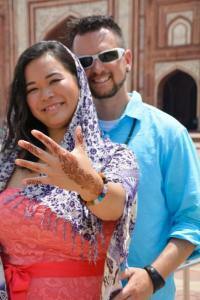 We also offer these photo-shoots in Agra, Jaipur and other citieson request. These photo shoots are perfect for couples or small families who wish to create a high quality photo album of their pictures while they travel. DURATION: 3 hours or more. PLACES COVERED: Major monuments and other picturesque places in Delh. PRICE: INR 25000 for a couple. INCLUSIONS: Transport, entry fee of monuments, taxes. Assistance with dresses, makeup etc. can be provided on request. Apart from the tours mentioned above, the guests have the choice of asking for the places they want to cover or activities they want to do. Cost of such tours varies according to duration, places, activities included, Contact us to design your own custom tour. All of these tour offer the following services mentioned below. TRANSPORT: Pickup and drop free from most areas of central Delhi. A fee of INR 1500 for areas outside this zone. NO MINIMUM GROUP SIZE: There is no minimum group size. We run the tours for single guests too. EQUIPMENT RENTAL: Photography equipment like lenses, tripods, camera bodies, flash etc. are available for rent if needed. ENTRY FEE INCLUDED: Entry fee for all the monuments is included in the cost mentioned.